India recorded their biggest innings victory by thrashing West Indies inside three days of the first Test in Rajkot. The tourists were forced to follow on after posting 181 in reply to India’s 649-9 declared – a deficit of 468 runs. The second and final Test is at Hyderabad from 12-16 October. India’s previous largest winning margin by an innings was against Test debutants Afghanistan in Bangalore in June, when Virat Kohli’s side won by an innings and 262 runs. West Indies resumed on 94-6 after their top order collapsed in the final session on day two, facing a huge first-innings deficit following centuries by Kohli, Prithvi Shaw and Ravindra Jadeja. Roston Chase (53) and Keemo Paul (47) counter-attacked briefly but India took the final four wickets in the first session, with Ravichandran Ashwin claiming 4-37, as Kohli enforced the follow-on. Windies captain Kraigg Brathwaite, standing in for the injured Jason Holder, was removed by Ashwin for 10 before lunch, but fellow opener Kieran Powell provided some resistance by hitting 83 from 93 balls, including eight fours and four sixes. Kuldeep ripped through the tourists’ middle order, trapping Shai Hope lbw before dismissing Shimron Hetymer and Sunil Ambris in the same over. Chase then chipped Kuldeep straight to Ashwin at extra cover and the wrist-spinner’s fifth wicket came when Powell edged to Shaw at silly point. Kuldeep becomes the seventh bowler to take five wickets in a Test, one-day international and Twenty20 international – following compatriot Bhuvneshwar Kumar, New Zealand’s Tim Southee, Sri Lanka pair Lasith Malinga and Ajantha Mendis, Pakistan’s Umar Gul and Imran Tahir of South Africa. 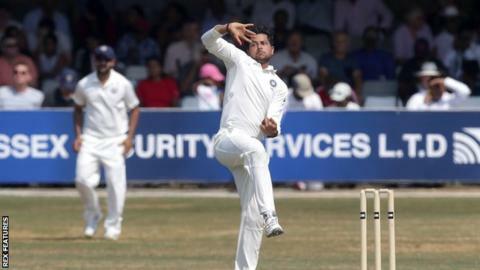 Jadeja cleaned up the tail with 3-35, with Shannon Gabriel caught at long-on for the final wicket, as the tourists were bowled out twice in under 100 overs.